It was not easy, but we finally did it! After 22 years me and my brothers Carmine, Ciro and Salvatore were able to spend a night together among ovens and pizzas, just as it happened years ago when we were little and in my father Antonio’s Pizzeria Fortuna we took our first steps in life and in the restaurant field. Now everyone is carrying on his path and, in his own way, is witnessing those values learned from our family: the work ethics, the passion for the Neapolitan culinary tradition, the friendship and the solidarity. All these values are kept, for Coccia family, in the pizza: the universal food capable to convey Naples and its specialties to the whole world. My brother Ciro and I live in the city (me with my two pizzerias “La Notizia” and “O sfizio d’ ‘a Notizia” and Ciro who is dividing his time between the historic pizzeria “Fortuna” in the Duchesca quartier and his “La Dea Bendata” in Pozzuoli), Carmine is running his pizzeria “Capri” in Castellón de la Plana – Spain and Salvatore manages the pizzeria “Motorino” in Paris. 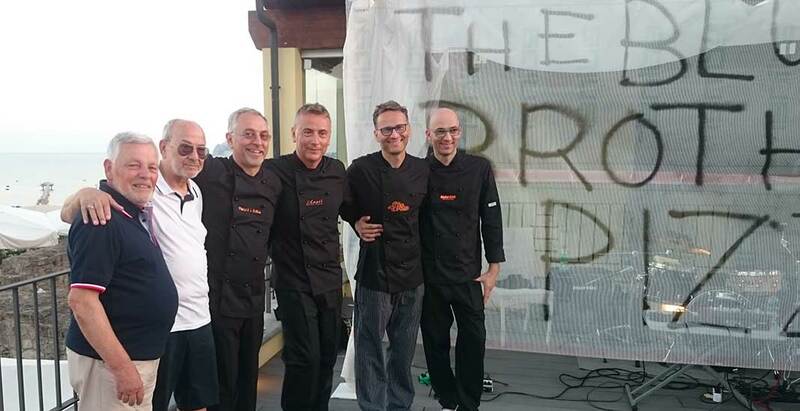 But for a night, on July 12, this family exodus was recreated at Villa di Livia in Pozzuoli for the fundraising dinner: “The Blues Brothers Pizza – Siamo in missione… per conto della pizza napoletana” (The Blues Brothers Pizza – We are on a mission from the Neapolitan Pizza) which earned 4.000 euros donated to the association Sostenitori Ospedale Santobono Onlus to support the renovation of the intensive care unit. Just a drop in the ocean of emergencies. How can I convey the excitement of that event? My heart was beating a thousand times a minute and it seemed, for a moment, to turn back the clock, bringing us back to those afternoons spent at our pizzeria Fortuna, our home, our family, when we were young. I wanted to stop the clock hands to July 12 while I was moved thinking about my parents who passed away and finding their gaze in that of my uncles Biagio and Mario who didn’t want to miss this gathering! And while I was taking this mental snapshot, Francesco De Gregori words echoed in my mind, as a background music: “La storia siamo noi… padri e figli siamo noi… la storia siamo noi… questo piatto di grano” History is us… we are fathers and sons… history is us… we are this plate of grain)… or rather – I would say – of pizza!